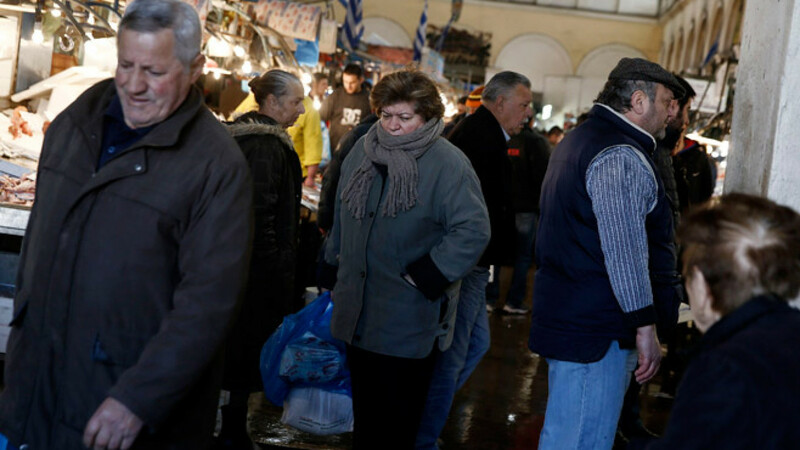 People walk at the Athens main fish market, Mar. 18. Greek Prime Minister Tsipras on Wednesday hit back at reported criticism from European partners on a bill legislating food stamps and free electricity to the poor, saying his government will not be scared into complying with lenders. Russia may offer Greece a discount on gas deliveries and new loans when Greek Prime Minister Alexis Tsipras visits Moscow this week, the Kommersant business daily reported Tuesday, citing one source in the Russian government. A Kremlin spokesman said last week that Russian President Vladimir Putin and Tsipras planned to discuss economic ties and EU sanctions on Moscow when they meet for talks, which Kommersant said would take place on Thursday. "We are ready to consider the issue of a gas price discount for Greece," the newspaper said quoting an unnamed Russian government source. Russia's state-controlled producer Gazprom declined to comment. The Energy Ministry also declined to comment. The source said that in exchange for the discount and some unspecified loans, Russia would want access to Greek assets. The source did not name any specific assets. In recent weeks, the gas price charged by Gazprom has fallen, tracking lower oil prices. Gazprom said it wanted to acquire DEPA in 2013 but dropped its bid after failing to receive enough guarantees over DEPA's financial position.